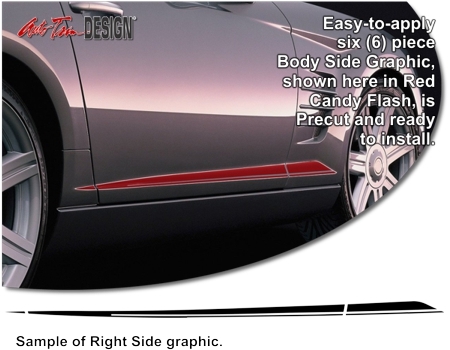 Make your '04-'08 Chrysler Crossfire unique with this lower Body Side Graphic Kit. This easy-to-install six (6) piece kit is PRECUT and ready to install in a wide variety of colors - NO TRIMMING required! This stripe package is not just a set of straight strips in a box. Our graphic kit consists of prefitted and contoured pieces that are specifically made for the '04-'08 Chrysler Crossfire and will not fit any other vehicle. Stripe is designed to be placed in the area shown and features a classic 0.1875" (4.76mm) pinstripe along the Crossfire's distinct body line.